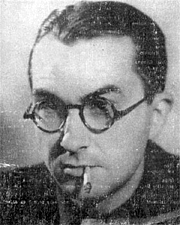 Paul Nizan, the son of a railway engineer, studied in Paris, where he became a friend of classmate Jean-Paul Sartre. He joined the French Communist Party in 1929, and much of his writing over the next 10 years reflected the party's political beliefs. He broke with the party in 1939, the time of the Hitler-Stalin Pact. He enlisted in the French military and died in the Battle of Dunkirk at the start of World War II. Paul Nizan is currently considered a "single author." If one or more works are by a distinct, homonymous authors, go ahead and split the author. Paul Nizan is composed of 3 names. You can examine and separate out names.